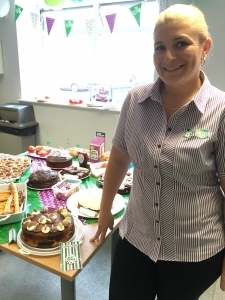 Over £240.00 was raised at the World’s biggest coffee morning hosted by Complete Co-Packing Services Ltd on Friday 30th September. The Winner of the great bake-off was Sarah Sheppard with her delicious chocolate and vanilla marble cake. A total of £241.21 will be donated to Macmillan Cancer Support while a further £93.00 was raised when staff took part in Jeans for Genes earlier in the month.